“Thank God it’s Friday!” nearly every one has that thought each Friday. This morning it was more heartfelt than usual because we have one more free day to enjoy: Monday, September 3rd we celebrate Labor Day! But honestly, do you really know why we celebrate Labor Day? 1. Labor Day is an American federal holiday observed on the first Monday in September that celebrates the economic and social contributions of workers. It pays tribute to the contributions and achievements of American workers. 2. One of the reasons for choosing to celebrate this on the first Monday in September was to add a holiday in the long gap between Independence Day and Thanksgiving. 3. 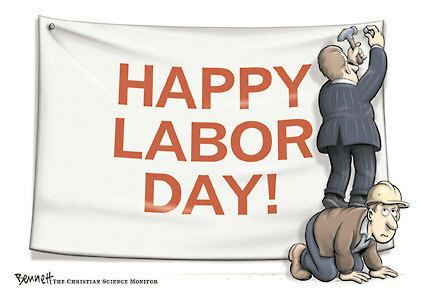 The first Labor Day was held on Tuesday, September 5, 1882 in New York City. Its origins stem from the desire of the Central Labor Union in that city to create a holiday for workers. It became a federal holiday in 1894. It was originally intended that the day would be filled with a street parade to allow the public to appreciate the work of the trade and labor organizations. After the parade, a festival was to be held to amuse local workers and their families. 4. Traditionally, people did not wear white clothes, particularly shoes, after Labor Day. 5. It is largely a day of rest in modern times. Many people mark Labor Day as the end of the summer season and a last chance to make trips or hold outdoor events. So why connect Labor Day with barter? Barter was the first form of commerce; before the introduction of currency the goods and services produced by workers was traded…what you have for what you want. It was a pure and direct bridge between the fruits of your labors and what you needed to improve the quality of your life. These days barter remains a great way to share what you have that is no longer of great value to you and get what is. It recycles our work products and preserves our environment. So if we can let’s find what we need through BarterQuest and barter to get back to our working roots appreciates the work of trade every day. Mark your Labor Day as Barter Day!